Intel today announced it has begun shipping its Intel® Stratix® 10 SX FPGA – the only high-end FPGA family with an integrated quad-core ARM* Cortex*-A53 processor. With densities greater than 1 million logic elements (MLE), Intel Stratix 10 SX FPGAs provide the flexibility and low latency benefit of integrating an ARM processor with a high-performance, high-density FPGA needed to tackle the design challenges of next-generation, high-performance systems. By integrating the FPGA and the ARM processor, Intel Stratix 10 SX FPGAs provide an ideal solution for 5G wireless communication, software defined radios, secure computing for military applications, network function virtualization (NFV) and data center acceleration. For NFV applications that consolidate and deliver the networking components needed to support a fully virtualized infrastructure, Intel Stratix 10 SX FPGAs can handle the high-speed data path while integrated processors enable the low latency transactions needed to manage flow tables for control plane processing. With hardware acceleration, Intel Stratix 10 SX FPGAs provide a heterogeneous computing environment to create optimized, low latency accelerators. In secure computing applications, integrated processors make it much more difficult to snoop software operations thereby helping keep data secure. These devices also enable general purpose utility processing to extend convenience and form factor reduction in high-end systems. Customers can implement their designs today with the Intel Stratix® 10 SX FPGA, using the Intel SoC FPGA Embedded Development Suite (Intel® SoC FPGA EDS), a comprehensive tool suite for embedded software development. It comprises development tools, utility programs, and design examples to jump-start firmware and application software development. The Intel® SoC FPGA EDS also enables customers to utilize the ARM* Development Studio 5* (DS-5*) Intel SoC FPGA Edition to code, build, debug and optimize their applications. 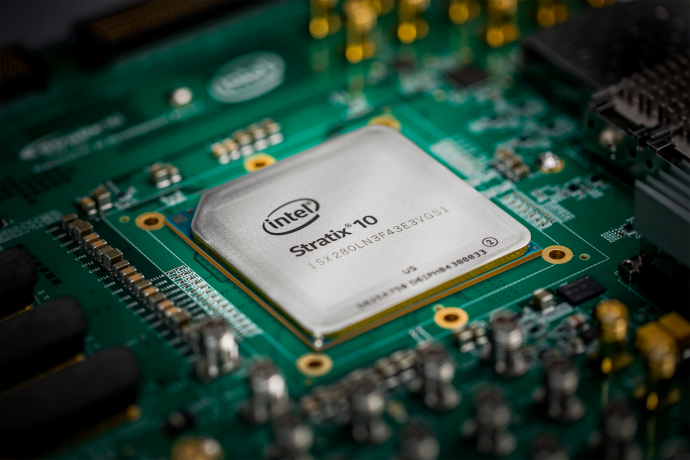 Manufactured on the Intel 14-nanometer process technology, the Intel Stratix® 10 SX FPGA combines an ARM hard processor system with the Intel HyperFlex™ core fabric architecture to create a high-performance and power-efficient SoC FPGA. Intel, the Intel logo, Stratix, and Intel HyperFlex are trademarks of Intel Corporation or its subsidiaries in the U.S. and/or other countries.